Here is a belated contribution to the recent Presidential election frenzy in the US. This is a Barack Obama 'Yes We Can' flag. It is rare when an American campaign slogan becomes a worldwide phenomena, but Barack Obama's 2008 presidential campaign slogan of "Yes We Can" seems to have transcended international boundaries and become just that. Naturally, there are flags associated with it. The Slogan was first introduced into the American political scene in "Senator" Barack Obama's remarks after he won the Democratic presidential primary in South Carolina, the slogan has since then spread far and wide. Originally used by the Scottish National Party's campaign in the United Kingdom General Election in 1997, it was re-purposed by Obama with his words "...and where we are met with cynicism and doubt and fear by those who tell us that we can't, we will respond with that timeless creed that sums up the spirit of the American people in three simple words - yes, we can." It should be pointed out here that for years the slogan has been used by the character of "Bob the Builder" in the popular British children's animated television show, which in turn, we might even speculate that this influenced its use in the Obama family. Whatever the origins of the slogan, it has now been adopted by the United Farm Workers and is well known amongst Latinos in its Spanish form Si se puede. In the 2014 Indian General elections, Chief Minister Narendra Modi used the chants of "Bharat Mata Ki Jai" and "Vande Mataram" to start off his Bharatiya Janata Party's campaign." We call that the USA - Yes We Can flag. 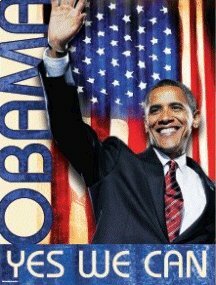 Here's also the Obama - Yes We Can which is available as a vertical flag only. It was a slogan for the one candidate, Barack Obama. When the win became evident, supporters switched from chanting "yes we can" to "yes we did". My point is that there are more than one. Already there are two groups of items with the slogan on them. To distinguish between the two, we call one USA-ywc (USA/stripes) and the other Obama-ywc because it has his picture on it.